When I was 14 years old I visited Europe for the first time. It was a guided bus tour that went around Germany and Scandinavia. Two years later, in 1998, we hosted a German exchange student for a month. That June I stayed with his family for a month. I repeated the exchange program again in 2000. 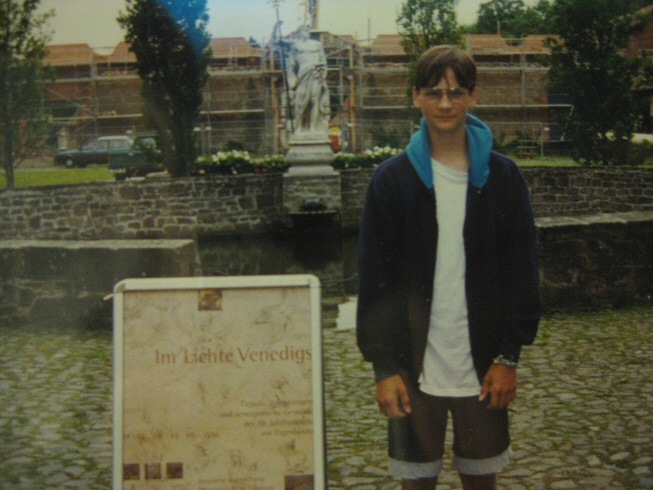 Having friends in Europe makes traveling there very affordable for a young adult, so I returned to Germany (among other countries) in 1999, 2001, 2002, and 2003. As the fairytale that is youth slowly ended, I found myself unable to reasonably return to Europe due to budgetary constraints. Fast forward to 2012, when I decided to jump into the credit card game head first. The endeavor had a dual purpose: move debt onto 0% interest cards and get some points and miles for my trouble. I didn’t have any concrete plans to use my miles and I soon half-forgot about my accumulated points/miles. When my wife graduated from college in 2008 she cashed in a promise I had made to her years earlier, and we invested in a new car for her. In summer 2013 I graduated and thought to myself: I deserve a reward too, right? I knew it would be at least autumn before I heard back about any jobs, so I hatched a plan to return to my estranged vacation hang-out, Germany. Historically my trip planning process has been overly involved and unnecessarily thorough. I enjoy the process. But for this trip, I had to act fast because award flights for the dates I was planning to travel were disappearing fast. I think the whole planning phase lasted about a week, from committing to the idea to booking the plane tickets. My first step was to re-establish contact with my friends in Europe. Once I confirmed that I had a place to stay and people to see, I started shopping for award flights. My only real option at the time was United Airlines. A benefit to United’s award ticketing scheme is that you can book two one-ways for the same amount of miles as the round trip to and from the same region. One of my German friends had moved to Switzerland so an open jaw itinerary would be very convenient. Not needing to travel back to the city I flew into would save me at least half a day of train or car travel. My trip was short to begin with (7 days) so being able to fly out of a different city for the return flight was very valuable to me. I found two economy one-way award seats, both at the saver miles level. I would fly from Minneapolis to Zürich, and then return from Frankfurt to Minneapolis.The cost was 60,000 United miles and $140.70 in fees. Not bad for a round trip flight to Europe in June! My short flight from Minneapolis to Toronto was uneventful. Although I booked through United, this flight was operated by Canada Air Jazz. The aircraft was a Bombardier CRJ-200 regional jet. The experience was what you would expect on a jet this size: short, cramped, and skimpy service (one beverage and a bag of pretzels). My 5 hour layover at Toronto Pearson Int’l Airport was fairly comfortable considering I had no lounge access. The public seating areas feature nice leather chairs, stone tops, ample power outlets, and an iPad at every seat. The iPads can update you on your flight information, provide weather and news, and let you order from the nearest bar/cafe. My only real complaint about the YYZ public areas was the horrendously slow and spotty wi-fi connectivity. My flight from Toronto to Zürich was on a Canada Air Boeing 787-8 Dreamliner, which is one of the flagships of the new generation of commercial jetliner engineering. It is supposedly very fuel efficient and comfortable. 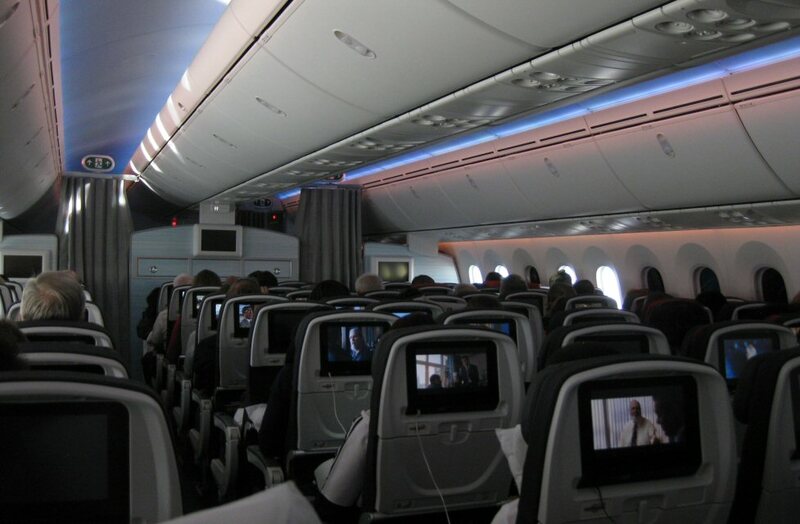 The on-board literature made several claims about the design, including: increased cabin pressurization and humidity (was supposed to reduce jet lag), passenger-dimmable window shading, more headroom for a more open feel, and aesthetically designed lighting for a calmer atmosphere. Oh, and by the way the seats are thinner too, so they can cram more seats in economy with supposedly no loss of leg room. Well, at 6’2″ I was cramped and uncomfortable anyway. However, the other gimmicky-sounding innovations actually seemed to improve the overall experience. The pressure and humidity seemed to make me feel generally not as crappy by the time we landed, and the lights and big windows were just really cool to look at! Overall I think the Dreamliner is a bit hyped, but it does live up to a decent portion of that hype. The first leg of my trip was to visit an old friend. Hannes is one of my German exchange students, now living in Switzerland. 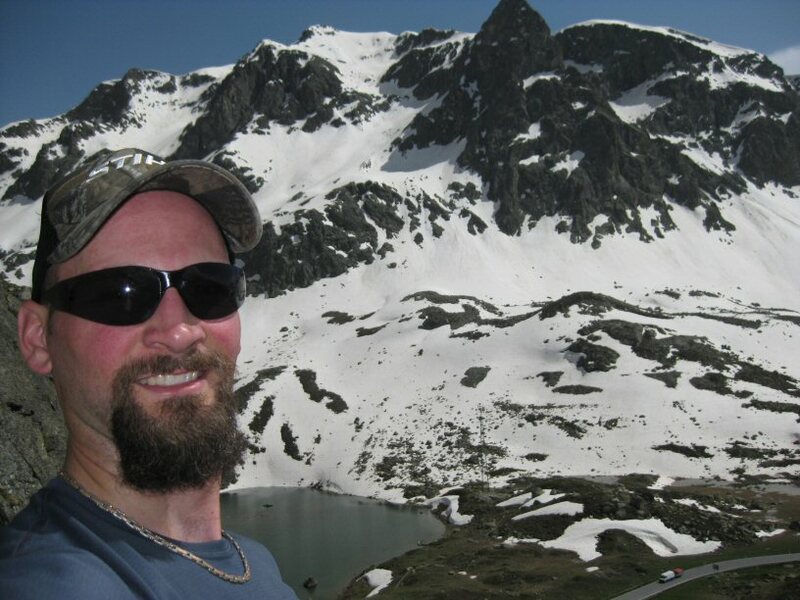 I won’t give too many details about my stay there except to say that Switzerland is an exceptionally beautiful and clean country, and I would recommend it to anyone. We spent most of my first day there driving through the Alps and we even swung by the tiny country of Liechtenstein. 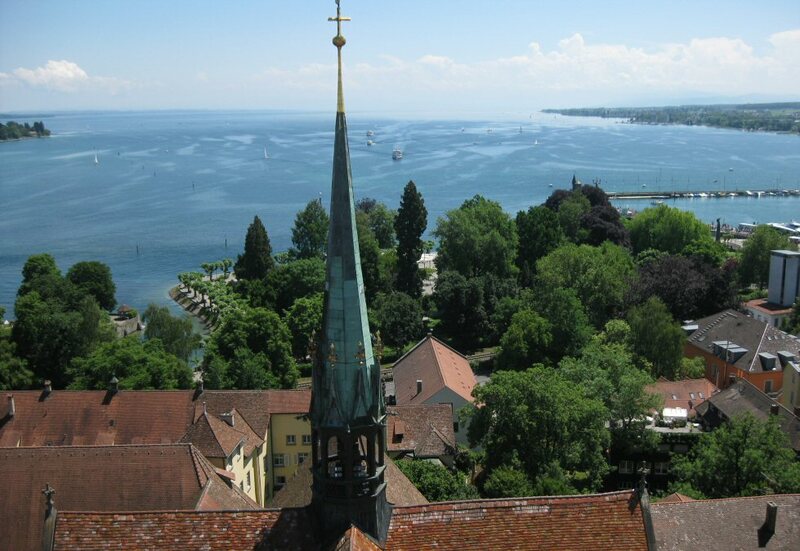 Part of my time with Hannes was spent just over the border in Konstanz, Germany, to visit his mother and to see the city where he went to school. Konstanz is perfectly charming and I would highly recommend it to anyone near southern Germany. The next part of my short trip brought me back to familiar Germany. There I stayed a few days each with two old friends, both named Christian. The first Christian was my first exchange student back in high school, and it was great to see him and his family again after so many years. 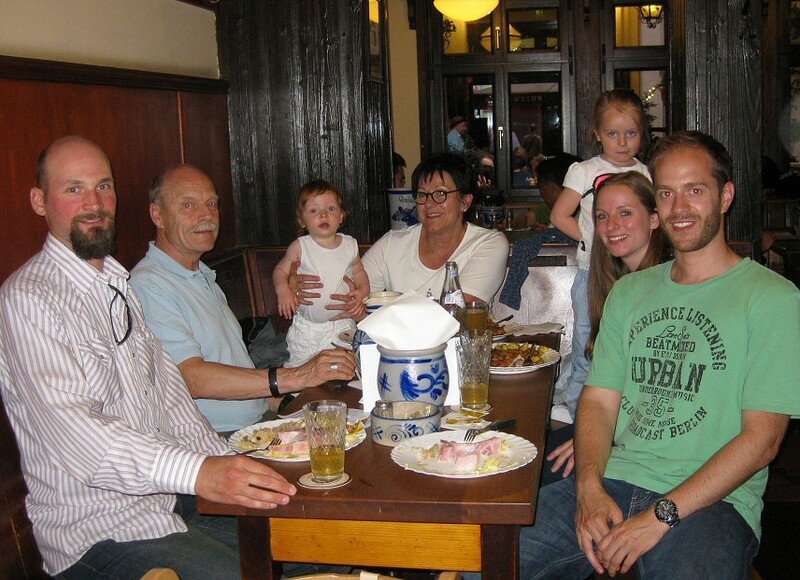 Christian 1 lives near Frankfurt and after a few short days it was time to move on to Christian 2, who lives near Siegburg. The timing worked out so I got to his house the day of his birthday party, so it was a perfect way to see all his friends and family together in one place. Although the trip was only 7 days, it seemed like a lot longer. I managed to fit in a lot of variety in my short time, and the fact that the main expense (airfare) was virtually free made the whole thing seem even sweeter. My return itinerary once again had me stopping over in Toronto, but the long haul flight was on Lufthansa. The flight was your standard transatlantic economy seat on a Boeing 747-400: nothing to write home [or online] about. Although it was an older aircraft, the service and food were better. I have always found Lufthansa to be a step above U.S. carriers in these departments. My layover in YYZ was shorter on the return flight, and I spent most of my time sitting in a chair, staring at the wall, wishing I were still on vacation in Europe. The flight from Toronto to Minneapolis was a mirror image of the previous Canada Air Jazz flight, except in a slightly larger aircraft, the Bombardier CRJ-705, which has a small 1×2 business class cabin in addition to the 2×2 economy seating. This is the fun part! Using the tactics outlined on this site, a week long vacation spanning three European countries, including airfare, transportation, and lodging only cost me 320.58 !! The airfare cost me 60,000 United miles, which I transferred from my Chase Ultimate Rewards account, earned mainly with my Sapphire Preferred card, and $140.70 in fees. Buying both one-way tickets (MSP > ZHR and FRA > MSP) directly from the United website would have cost $6587.90 in cash! Now to be fair, I would have never done that had I not had the miles to spend. Realistically I would have bought a round trip (MSP > < FRA) and spent the additional day traveling back to Frankfurt from Zürich. But even that ticket would have cost $1733.20 and I got a better itinerary for $140.70 cash! I took trains from Zürich to Frankfurt and Siegburg to back to Frankfurt. The total for my train travel was $195.74. I used my Barclay Arrival Plus for these online train purchases and later redeemed 10,000 Barclay Arrival miles for a $100 credit. So that brought the rail expenses down to $95.74. I also traveled a lot by car. I recorded $252.41 charged to gas stations in Europe. These charges were split among three purposes: 1) paying my share of group travel (I count this as transportation cost); 2) being a stand-up guy and filling the tanks of my hosts (this was actually in lieu of bringing any gifts for them); and 3) using my friends as human ATMs, an awesome tactic I will write a whole post about soon. In stead of tracking every cent, I am just splitting the $252.41 three ways, for an estimated car travel cost of $84.14. None, $0.00. Staying with friends makes travel cheap! Besides the cost savings, you get to see the real country, not just the tourist destinations. If you have any friends in foreign lands, I highly recommend staying with them when you travel. Just be sure to be a gracious guest and to reciprocate the offer to host them any time they are traveling in your corner of the world. I don’t include these costs in the value break-down because they are highly variable based on your shopping habits and your cuisine choices. But for what it’s worth, I spent an estimated $555.54 on food, gifts, local entertainment, and clothes. This included a $325 pair of Lederhosen, so the food and smaller gifts were actually just over $200 for the week. Considering I would have probably eaten about $75 in food in a week at home, this is getting by pretty cheap for the value I perceived. This entry was posted in Air Canada, Flight Reviews, My Story, Trip Reports, United Airlines on August 15, 2015 by Gomanson.